SAN DIEGO, Oct. 10, 2018 /PRNewswire/ -- Whether hitting the town or trail, subway or back road, protect Google Pixel 3 and Google Pixel 3 XL's incredible camera, vast storage and brilliant display with LifeProof NËXT. Available now, NËXT highlights the sleek lines of each device while protecting from the dangers of an active lifestyle. The NËXT line is available for a Pixel device for the first time in Black and Cactus Rose. 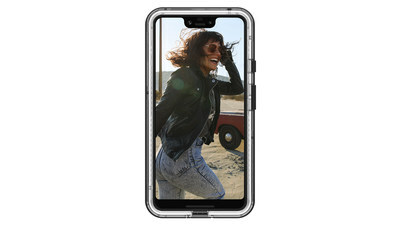 "Pixel 3 and Pixel 3 XL come packed with advanced photo abilities, unlimited storage and a louder front speaker," LifeProof CEO Jim Parke said. "When you want to get the most out of your device, NËXT is there to help you take full advantage of all of the features Google has pioneered with the Pixel lineup." NËXT offers drop, dust and snow protection to keep Google's latest innovation looking like new day after day. An open-screen design allows direct access to the display, while a raised, beveled edge protects from face-down drops. The two-piece design features a clear back and color pop around the edges. NËXT is drop tested to 6.6 feet (2 meters) while port covers and an acoustically transparent speaker mesh deliver IP-5X protection from dirt and dust. NËXT for Pixel 3 and Pixel 3 XL is available today for $79.99. For more information, visit LIFEPROOF.COM. ©2018 TreeFrog Developments, Inc. All rights reserved. The LifeProof name and LifeProof trademarks are the property of TreeFrog Developments, Inc. registered in the U.S. and other countries. All other trademarks are the property of their respective owners.